Fact Check: Is India's Declining Cash to GDP Ratio an Indicator of Progress? The government's attempts to reduce the CIC-GDP ratio by merely reducing currency in circulation without the necessary structural reforms are likely to have deleterious consequences. 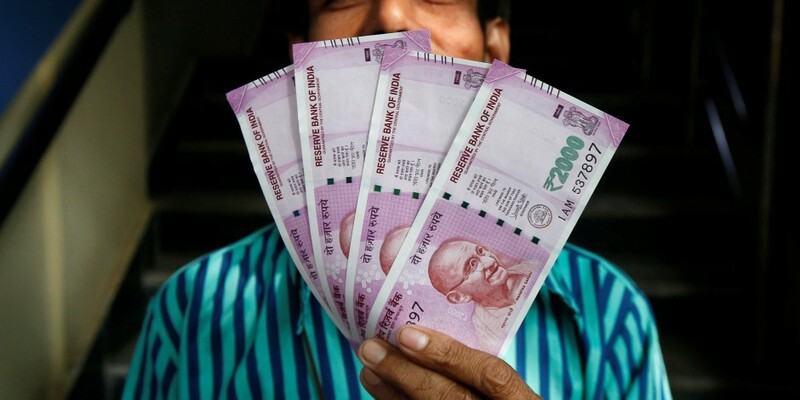 The latest claim made by the government, in a series of alleged benefits from the demonetisation of November 2016, is the drastic reduction of cash to GDP ratio from 12% to 9%. Our prime minister had made this claim while addressing a gathering of company secretaries at a programme to mark the golden jubilee year of Institute of Company Secretaries of India in Delhi on October 4, 2017. It is a moot question whether a lower currency in circulation-GDP (CIC-GDP) ratio is a sign of a more developed economy or not. Before venturing to find its answer, let us examine certain facts. Let us compare our CIC-GDP ratio from FY 2009-10. The CIC-GDP ratio of 12.3% in 2009-10 saw a gradual reduction to 11.6% in 2013-14, when Manmohan Singh relinquished his office. Under the leadership of Narendra Modi, by 2015-16, it had shot up to 12.2%, and then witnessed a drastic, if disruptive, reduction to 8.8% in 2016-17. Our prime minister conveniently overlooked or glossed over the fact that this apparently lower ratio was arrived at based on Rs 13.353 lakh crores CIC as on March 31, 2017, when the remonetisation was still ongoing, and not yet completed by a long chalk. As per the latest RBI release, the CIC has increased to Rs 16.004 lakh crores as on October 6, 2017. This means that the CIC has already recorded a jump of 19.8% within the last six months. When computing the CIC-GDP ratio, nominal GDP is considered. If we account for the fact that GDP at current prices (nominal GDP) is growing at 9.3%, the present currency-GDP ratio has already crossed the 10% mark. An interesting fact one should not lose sight of is, despite all the pious announcements, the total CIC has reached to approximately 90% of the pre-demonetisation stage. When GDP is slipping, this will reflect in a higher CIC-GDP ratio further down the line. 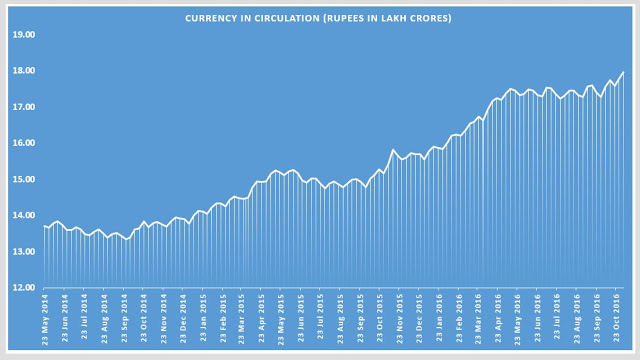 Another fact not to be missed is how the currency in circulation spiked under Modi before the war on cash was declared. When he assumed office on May 26, 2014, the currency in circulation was Rs 13.715 lakh crore (as on May 23, 2014) and it reached Rs 17.977 lakh crore on November 4, 2016, a few days before demonetisation was announced. This is a growth of more than 31%. Look at the steep increase recorded between October 2015 and May 2016 in the CIC. It is quite baffling that if demonetisation was a considered decision taken after months of brainstorming, why then did the RBI keep pushing more currency into circulation in the interim? Our finance minister, while giving an interview to the CNN-News18 on November 10, 2016, immediately after the demonetisation, made some sweeping statements about the CIC-GDP ratio. Credit: The Curse of Cash (Data: July 2016). The question remains whether a lower CIC-GDP ratio is an indicator of more structurally-evolved economies or not. If it is then how does the finance minister account for countries such as Japan, Hong Kong and Switzerland having ratios which are either higher or comparable to that of India? The World Bank also ranks these countries higher on ease of doing business, as well as tax and regulatory compliance. 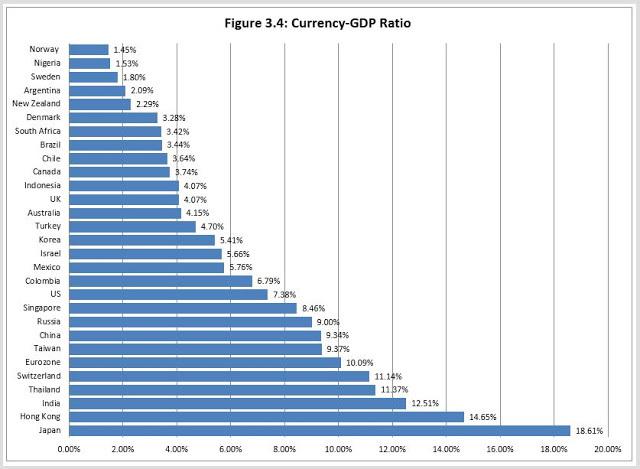 If the CIC-GDP ratio is indeed relevant to efficiencies, it is ludicrous to reach a conclusion that South Africa, Brazil and Turkey are more “efficient” than Singapore, Switzerland and Japan. The undeniable truth is that economic, technological, cultural and sociological factors that influence currency demand differ across countries. Next, let us examine if Rs 17.977 lakh crores is unwarranted in relation to the population of India. If we translate this amount to per capita, then it becomes just Rs 14,382 with each citizen. Does this make India an outlier? Look at another graph from The Curse of Cash again. We can see from this graph that we hold one of the lowest cash per capita. While people in the countries with lowest currency-GDP ratio viz. Norway, Sweden, Canada, etc, have substantial per capita currency. Attempts to reduce the CIC-GDP ratio by merely reducing currency in circulation without the necessary and preceding structural reforms will only lead to unintended and deleterious consequences which we are experiencing currently. When the government removed 86% of the currency in circulation, they called on the people to go ‘digital’. But little did they consider the options available to the large majority (approximately 70%) of our countrymen resident in rural areas. The misadventure of abruptly removing cash without ensuring alternate choices to a majority of the population finally resulted in shrinking of the GDP growth. Let us examine some hard facts about the rural India from the socio-economic Census data 2011. If mobile phone ownership is taken state-wise, it is as low as 28.58% for Chhattisgarh, 33.58% for Odisha and 44.18% for Arunachal Pradesh. If we look at the urban population, data from the same source reveals that 13.28% live in slums and 20.3% don’t possess a mobile phone. What options did the government leave for these people for transactions when they removed cash and bragged about structural reforms? How bizarre is it to exhort these people to embrace digital payments when every day is a struggle to make both ends meet? We have paid a huge price for the misadventure both in personal misery and GDP growth. But instead of putting up their hands and honestly admitting making a snafu through an ill-planned misadventure called demonetisation, the government is adding insult to injury by spouting outlandish and far-fetched claims to justify the totally avoidable pain inflicted on the public, especially to the lower strata of the society, as if they think they can fool all the people all the time. James Wilson is working with Inter State Water Advisory Committee of the government of Kerala. He tweets @jamewils.